Aberdour station is in the village of the same name in Fife (Scotland) and is situated on the Fife Circle Line. It was opened in 1890 as part of the approach routes linking the Edinburgh and Northern Railway to the then new Forth Rail Bridge. It then became part of the London and North Eastern Railway during the Grouping of 1923, before passing to the Scottish Region of British Railways upon nationalisation in 1948. The station is served by two trains per hour on weekdays, serving around 125,000 passengers per year, and has won several awards over the years for its gardens. 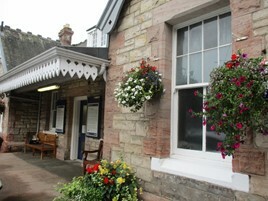 The NRA judges said that Aberdour offers the ultimate small station experience. Its extensive gardens join seamlessly into the village and the whole local community seems to support its local station. Its welcoming staff have become ambassadors for Scotland and ScotRail, and the judges said it made them feel as though they were on a film set!